Access to the internet is integrated into almost every digital device your children may use. While there are various filters and monitoring software you can use to keep their experience healthy and safe, it also helps to have some basic internet rules. Turn off location identifier on any pictures that are posted. Use privacy settings. For example, only allow friends to access videos or posts. Ask permission before downloading, installing or buying anything. Add something online only if you are comfortable with parents, teachers and coaches seeing it. All digital devices are turned into parent’s room by ___:___ each night. Limit screen time to ___ hours per day. Discuss your expectations and the reasons behind the rules. Post the rules in an area where everyone can easily see them. 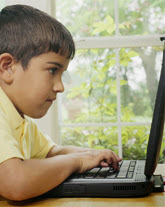 Plan to have ongoing discussions with your kids about the internet. News stories are a rich source of examples of what can go wrong with kids and technology. Use those stories to discuss important issues with your kids. The nine rules to consider are so useful for all parents. I tried to pick my favorite rule but couldn't. Thanks for sharing these, Kathy. Posting them on the fridge is a great idea.